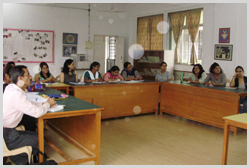 Staff training programs In-house training of teachers and therapists working with students with disability are conducted regularly. At the beginning of each academic year an intensive two day training program is conducted to train the new staff and to update the existing knowledge of older members of the staff, in order to maintain high standards of service delivery to students attending the various centres of SOPAN. Training of interns Trainee teachers and interns from varied disability related professional courses conducted by reputed educational institutions, such as SNDT Women’s University, Dilkhush Teacher Training Centre, Spastics Society of India, National Institute for Mentally Handicapped, Tata Institute of Social Sciences and School of Audiology, BYL Nair Hospital are provided placement and training in Samarpan, Spandan and CDD for practical experience. Parent enrichment program This is a unique program offered to parents whose children attend the centres of SOPAN. 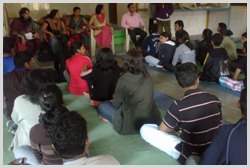 Parents observe on going therapy sessions and gain practical experience in teaching children. This training is done under supervision of the class teacher. The knowledge they have gained is used with their own children at home or in assisting teachers in class. 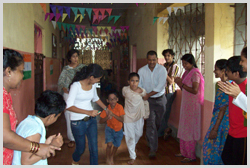 Home based programs are given to some children who cannot attend the centres regularly. Such children take back a home program in which the parent is given hands on training to execute the home program and they come back for follow up regularly to ensure smooth implementation of the program. On-site training Professionals from SOPAN are acknowledged resource persons in the field of autism and Developmental Disabilities. They are regularly invited by other organizations for disability related workshops, seminars, lectures, CREs, conferences etc. Parent training programs Workshops, training programs and seminars for parents are conducted on various topics like management of challenging behaviors, speech and language therapy, teaching strategies, sensory integration therapy, stress management, legal provisions, government policies, national trust schemes, counselling etc. Short-Term certificate course in ASD Many professionals working in the field of disability and parents of children with ASD find it vital to understand the nature and characteristics of ASD. They also sense the need to learn specific research- driven techniques essential in training and rehabilitating such persons. However, it is difficult for these professionals and parents to attend a full-time course in ASD. SOPAN realized this growing need and began conducting a short-term certificate course in ASD, since the year 2007. The course content is approved by the RCI. This course is ideally held once every academic year and begins in the month of July. It is held part-time after school hours on pre-determined days. Thus, it allows professionals to attend without being absent at work. B.Ed. special education (Autism Spectrum Disorders) course (proposed) : Sopan intends to start the B.Ed. 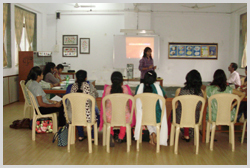 Special Education (Autism Spectrum Disorders) to prepare teachers for working with children with autism. This will be the first teacher preparation program for autism at the graduate level in the country. The program has been proposed on the basis of community assessment that reflects a rise in prevalence and incidence of autism. With the implementation of the Right to Education act (2009), most of the children with autism would be educated in general schools. Hence, the proposed B.Ed. program would meet the required need for trained teachers for the children in such schools.